Nick Roberti says his British-based employer Just You is the perfect antidote for those who dread the thought of sharing a room with a fellow vacationer who will be sawing wood loudly throughout the night. Just You – which uses the tagline “solo adventures together” – is the only tour operator in Canada specifically catering to those who wish to travel with a group, but without a roommate, he says. The company – which doesn’t charge single supplements – won’t book two people into the same room on one of its itineraries. Those wanting to share a room with a partner must book separate rooms, although they can still share a room, something that will leave one of the booked rooms empty. “Right now, in Canada, we’re the only tour operator that’s focusing on solo travel,” Roberti told a Wednesday Toronto reception. Just You has been active in Canada for over a year, but was founded over 10 years ago. He said solo travel is the fastest-growing travel trend, and has a large number of potential clients in this country, with a 2016 Statistics Canada survey stating that 52% of Canadians that year were either single, separated, widowed or divorced. Those who will be sharing a room with a stranger on other tour operator itineraries may worry that their roommate will snore through the night or the face the more concerning possibility that they’ll “end up sharing with a weirdo,” Roberti said. Roberti said Just You has “taken some of the meals off” the itineraries as clients sometimes wish to find their own restaurants. Just You has released a brochure detailing itineraries on five continents and plans to add trips to the others. The average cost of one of its itineraries is $2,174. Just You offers guaranteed departures. 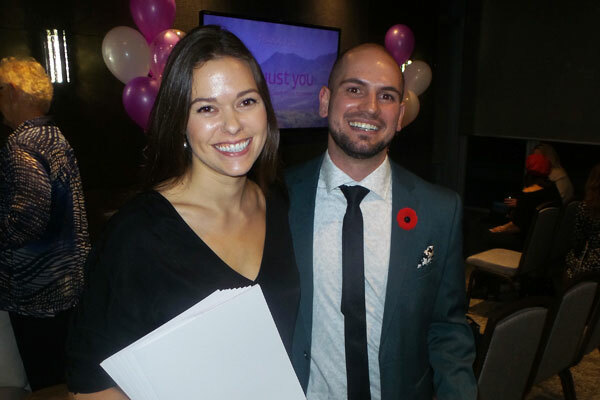 Pictured during the Toronto gathering are Just You’s Nicole Harvey and Roberti.